Young Rockers is for beginning music students ages 8-12. We make music education fun. Our beginning rock band program the Young Rockers is for aspiring and beginning musicians ages 8-12 to experience the thrill of making music in a rock band. 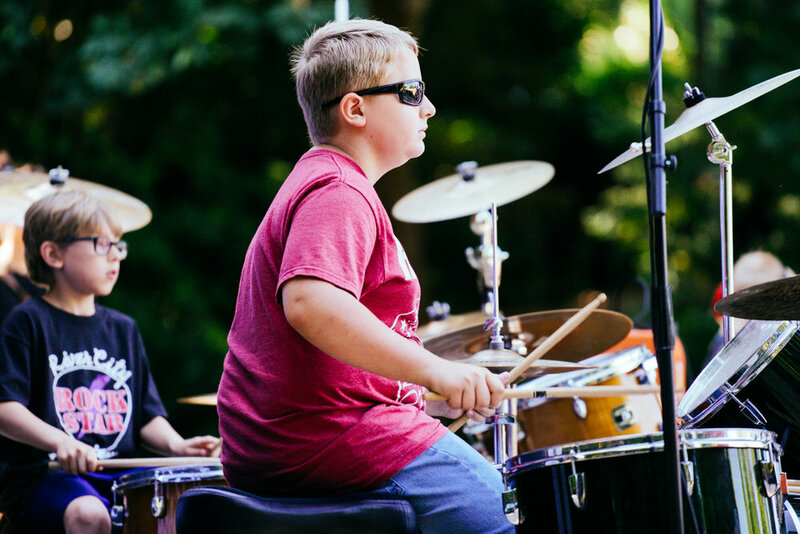 RiverCity Rock Star Academy combines weekly band rehearsals with a private lesson in an instrument of their choice — guitar, drums, bass, piano, and/or vocals! Young Rockers learn music fundamentals and learn how to work as a team with band members. Students learn how to play songs from the greatest popular and rock bands of the last 60 years such as The Beatles, Nirvana, Ramones, Green Day, and much more! Rehearsals Mondays 5:30-7:00 pm. Starts on September 10th. The Young Rockers program includes a 90-minute weekly band rehearsal on Monday evenings from 5:30 pm to 7:00 pm, a weekly private 30-minute lesson, and a final season ending show over a 12 week season! Over 25 hours of professional music instruction playing in a band for the price that some charge just for music lessons. Check out our upcoming Fall Music Programs & Music Lessons for all ages and skill levels! The season-ending show featuring all of the RiverCity Rock Star Academy program bands including the Renegades, Young Rockers, Rockers - 90s, Rockers - Metal Mania, Rockers - Emo vs. Pop Punk, and Royals will be performing a FREE, ALL AGES and OUTSIDE show at Keizer Rotary Amphitheater! The concert starts at 4:00 pm so bring your chairs or blankets and enjoy the music! Shout out to all of our RiverCity family that rocked Make Music Day - Salem! We want to thank all the teachers, students, parents, friends, and RiverCity family that made Make Music Day a success. It was a long day for many of us that started at 7:00 am and finished up at 1:00 am. Thanks to our interns Mackenzie Rolf and Hunter Winnen, as well as student volunteer John Watson in helping us set up early in the morning and assisting throughout the day and evening. Thanks to all of our teachers and staff Kaylee Bonatakis, David Aizuss, Rebecca McDade, Monica Pomares, Douglas Hoffman, Topher Miguel Rodriguez, Jarred Venti, Wil Bakula, as well as staff Brian Hart, Abby King, Karen Hart Green, Danielle Green and Mark Green. Not only did our teachers help with gear set-up and break-down and directing our program performances, they also performed with their own bands or as solo acts Including the M69's, Lords of Blackpool, Sleep Millennium, City of Pieces, MARC & the Horsejerks, Mr. Frederick's product production co., Ukuladies, Center Mass String Quartet, Gabriel Cox Band, Sousapalooza, Percy Lounge, and Rebecca McDade. Huge kudos to everyone for helping to make it a great Make Music Day Salem!